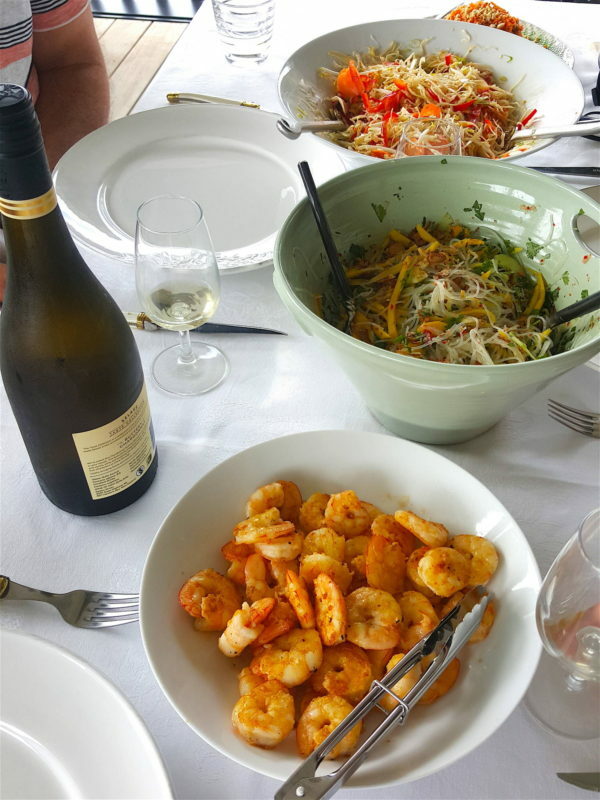 Mango & Cellophane Noodle Salad topped with prawns = Summer! I love this with prawns – pan-fried, barbecued in the shell, or any which way you like. 1 Boil a kettle of water and cool water for 10 minutes. Put cellophane noodles in a bowl and pour on hot water to cover. Leave noodles to soften for about 7 minutes, or until just tender but still a little resilient. Drain, rinse under running cold water, then drain again. Pass the scissors through the noodles several times to make them shorter in length and more manageable to eat. 2 Peel mango, then cut thinnish off slices off the cheeks (fleshy parts) and cut off any other flesh. Slice finely. Peel carrot and cut into thin shavings with a potato peeler. Peel cucumber, cut in half and scoop out the seeds. 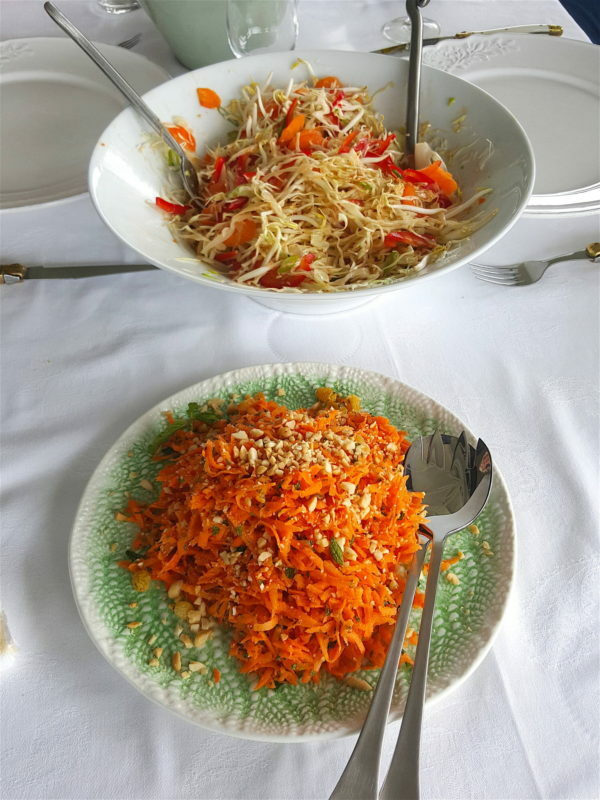 Cut cucumber into thin slices and put in a bowl with mango and carrot. 3 Mix dressing ingredients together in a small bowl and pour over mango and cucumber. Add coriander leaves and noodles and carefully toss together. Taste and add more lime juice if too sweet and a pinch more salt if necessary. 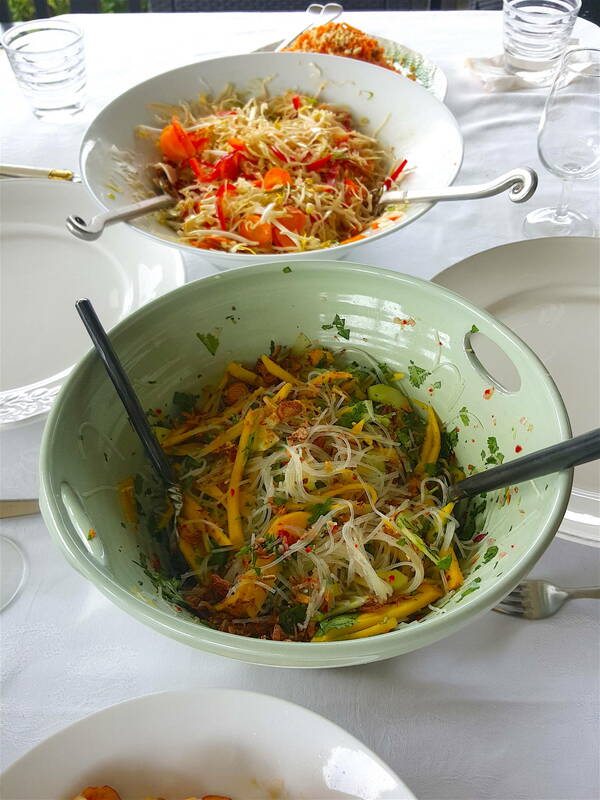 Serve immediately garnished with crisp shallots and chopped chilli. and a big bowl of succulent prawns.